The tight integration of Microsoft's Internet Explorer in the Windows operating system means that problems with the browser can have an impact on the functionality of the operating system, even if the browser itself is used scarcely or not at all. Our Repair Internet Explorer troubleshooting guide dealt with many problems that Internet Explorer users may need to resolve. The recent release of SF IE Restorator, a troubleshooting tool for Microsoft's Internet Explorer 8, adds another weapon to the arsenal. The program supports troubleshooting 32-bit and 64-bit editions of Internet Explorer 8. It is likely that the developer will add support for Internet Explorer 9 in the future as well. Some repair functionality may even be compatible with the new browser, but users who are not running IE8 should probably try every other option before they make use of this program to repair the Internet browser. The program requires the Microsoft .net Framework 3.5, but has no other dependencies. Users need to run it as an administrator. This is best done by right-clicking the file in Windows Explorer and selecting the Run As Administrator option from the context menu. Flush / Review DNS IP:This is probably the option that is the least used in this software. It will simply empty the DNS cache which can be helpful if a bad our outdated DNS has been stored in the cache by Internet Explorer. 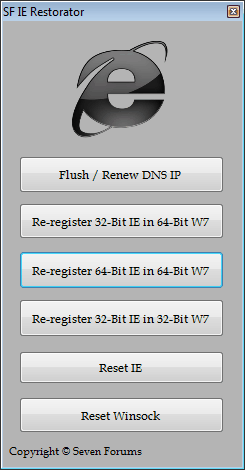 Re-register IE: The three buttons available can be used to re-register relevant dlls for 32-bit and 64-bit editions of Internet Explorer in Windows 7. This may also work in other operating systems. Reset IE: This resets all Internet Explorer settings and add-ons to their default values. Reset Winsock: Resetting Winsock can solve problems related to connectivity problems in the browser. This often happens after new driver installations or software installations that are manipulating network data. We recommend to use this program as a last resort, if the standard troubleshooting options to do not resolve the issues. SF IE Restorator is available for download at the Seven Forums forum thread.